German philologist and theologian; born at Heidelberg Sept. 4, 1877; educated at the public school and the gymnasium of his native place, the universities of Heidelberg, Vienna, and Berlin (Ph. D. 1901), the Israelitisch-Theologische Lehranstalt at Vienna, the Veitel-Heine-Ephraim'sche Lehranstalt and the Lehranstalt für die Wissenschaft des Judenthums, Berlin (rabbi, 1903). 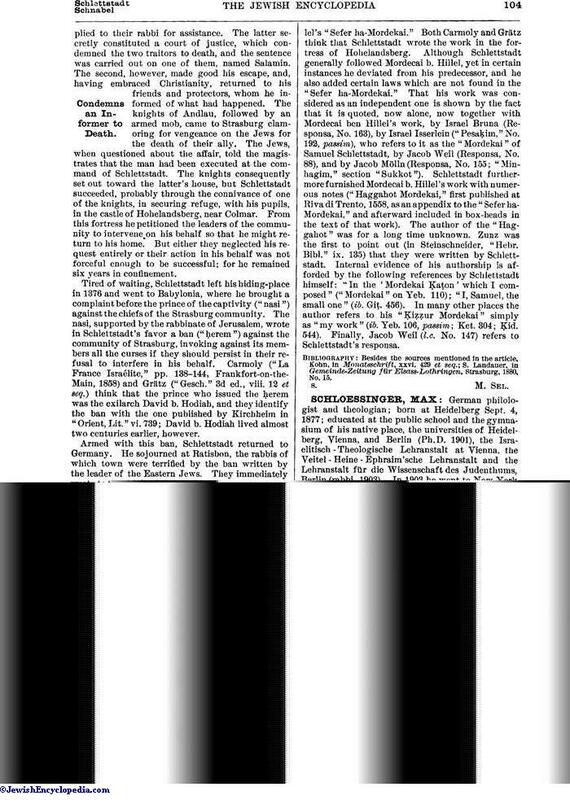 In 1903 he went to New York and joined the editorial staff of The Jewish Encyclopedia, which position he resigned in 1904, on his appointment as librarian and instructor in Biblical exegesis at the Hebrew Union College, Cincinnati, Ohio. Schloessinger has published "Ibn Kaisan's Commentar zur Mo'allaqa des 'Amr ibn Kultum nach einer Berliner Handschrift," in C. Bezold's "Zeitschrift für Assyriologie und Verwandte Gebiete," vol. xvi., part i., pp. 15 et seq., Strasburg, 1901.